I reprint here something I wrote in a long comment thread in Jill Sommer’s Musings from and Overworked Translator. The comment is about whether CAT tools are convenient for translators, when they make it easier for translation companies to “demand” discounts. I’m reposting it here as I believe it might be of general interest. By "nobody can demand a discount from a freelancer" I mean that we are always free not to work with certain customers, if we believe the conditions they insist on are not convenient for us. Of course, they also are free not to use our services, if they consider it not convenient for them. 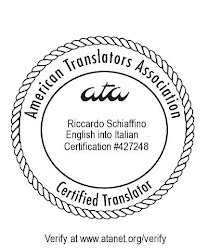 A VP from a certain major translation company last November announced that a "compulsory" 5% discount would be applied on all translator invoices for the next few months. Those of us, however, who declined to grant the so-called "compulsory" discount continued to be paid at our usual rates. Of course that means that one should be ready to ditch a customer who makes unacceptable demands. We were able to resist the "compulsory" discount because that customer represented for us less than 15% of turnover – we might have had to swallow and grant the discount if they had represented 80% of our total invoices. One of our first customers a few years ago asked us for a 20% discount across the board. In exchange they would "guarantee" more work. We decided not to work with that customer any longer, even though up to that point we had invoiced them several thousands (or dozens of thousands) dollars a year. Again, we had managed, through foresight (and a bit of luck), never to have that customer represent more than about 20% of our turnover – that was what gave us the freedom to decide not to work any longer with them. I totally agree with you. In France, it is even simpler : according to the Law, an independant translator is a freelance professional (professionnel libéral). Please note that in both French and English, the notion of freedom is included in the denomination (libéral = liberté =free = freedom). This is important from the legal point of view, because in France a freelance professional must determine his/her own rates. If it is the client who determines the rates, the freelance professional loses his/her freelance status and the Tax authorities and the URSSAF (agency collecting the social charges) consider him/her as an employee of the client, and the client has to pay the same social charges and taxes than any French employer, plus fines. The simple fact of requiring a compulsory discount from a freelancer is considered as establishing a subordination relationship between the client and the professional. So, you are right : nobody can demand a discount from a freelancer! I agree with you too! Freelancers are "free", they can choose their clients wisely and should never forget this right. They can decide when they wish stooping to compromises because they are responsible for themselves. That's the pleasure of not beeing an employee. Great point! And so true! Sadly, I think some freelancers forget about this, because they are so eager to get any business they can. But one has to keep in mind, not all business is necessarily good business! Care to explain your comment? I imagine you mean the higher the volume the greater the possible discount. I don't agree. That would mean locking yourself up with a lot of low-paying jobs and possibly finding yourself in a situation of having to refuse higher-paying ones. You are right Riccardo, Besides, some clients get the point that, if we make discount on bigger volumes, part of quality will be lost. Being more marketing-oriented gives your potential customer a sense of what this job requires of hard work. Freelancing is a good source of income. According to the blog that I have read (Freelancing Can Be a Career Option for New Graduates) is a good choice after graduating since there are many people in the market who are so eager to have jobs at the same time. That entirely depends on the freelancer whether he/she gives discount or not as long as the freelancer and client are both satisfied with the work.